President Donald Trump says the economy would have grown over 4% instead of 3.1% if the Federal Reserve had not raised rates during 2018. Trump added that he does not care if he “influenced or not” the decision to pause on rate hikes. In an interview with Fox Business Network’s Maria Bartiromo to be aired Friday morning, Trump took issue with the central bank’s latest projections for slower growth in 2019. “You’re right, the world is slowing but we’re not slowing, and frankly if we didn’t have somebody that would raise interest rates and do quantitative tightening, we would have been at over 4 [% growth] instead of a 3.1 [%],” Trump said on Mornings with Maria. On Wednesday, the Federal Open Market Committee brought down its expectations for U.S. GDP growth in 2019 from 2.3% to 2.1%. Fed Chairman Jerome Powell said that data since September suggests that “growth is slowing somewhat more than expected” as financial conditions tighten. 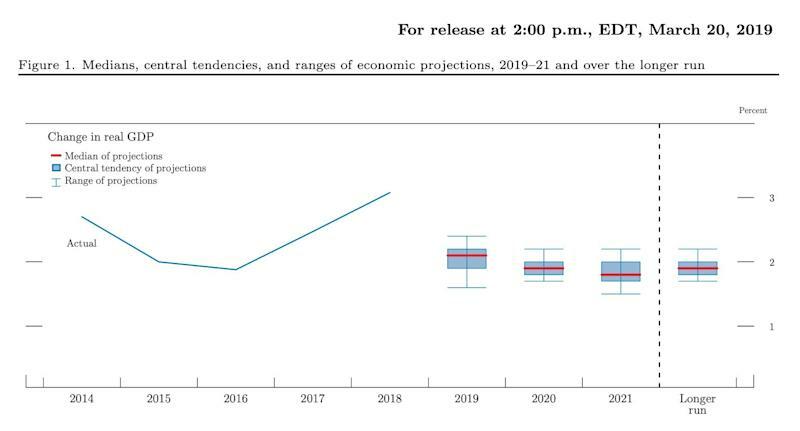 In the Wednesday meeting, the Fed telegraphed that it sees no rate hikes in 2019 and only one in 2020. Bartiromo asked Trump if he influenced the Fed’s decision to pause on rate hikes. “I don’t know. I mean look, I hope I didn’t influence frankly, but it doesn’t matter, I don’t care if I influenced or not,” Trump said. The Fed raised rates four times during 2018, the same year that Trump’s tax cuts were taking effect. Trump took to Twitter to attack the central bank for tightening policy during his efforts to jolt the economy through fiscal policy. The rhetoric built up ahead of the December meeting where the Fed did raise rates by 25 basis points to the current target range of 2.25% to 2.5%. Powell never directly responded to the president’s criticism, and said time after time that the Fed remains independent and is not swayed by policy preferences from the White House. At one point, rumors about Trump’s interest in removing Powell prompted the Fed Chair to publicly say that he would not resign from his post if asked to do so. After the Fed tilted dovish in the January meeting, Trump toned down his criticism of the Fed. In early February, Powell met with Trump at the White House for an “informal” dinner. Trump’s latest interview shows that he’s still hung up on how higher interest rates may have affected his fiscal policies. “One thing I was right, but we would have been over four [%] if they didn't do all of the interest rate hikes, and they tightened, I mean they did 50 billion dollars a month. I said what are we doing here?” Trump told Bartiromo. The “50 billion dollars a month” refers to the Fed’s process of quantitative tightening, in which the central bank unwinds asset holdings that it accumulated to lift the economy out of the 2008 financial crisis. Critics argue that the balance sheet reduction is reducing market liquidity. The Fed said Wednesday it will begin slowing the pace of its asset roll-offs in May and ultimately conclude the unwind process by the end of September. For his part, Powell has said the central bank does not think much of fiscal policy. Responding to a question from Yahoo Finance in a press conference Wednesday, Powell said fiscal policies are “exogenous” to the Fed’s decision-making.